HALIFAX, NOVA SCOTIA--(Marketwired - Nov. 9, 2015) - Erdene Resource Development Corp. (TSX:ERD) ("Erdene" or "Company"), is pleased to announce that a maiden drill program and geophysical surveys are now underway on its wholly-owned Bayan Khundii gold project in southwest Mongolia. The drill program is designed to test the near-surface, down-dip extension of the multiple, high-grade gold zones that were discovered by the Company in Q3 2015 during an initial surface sampling and trenching program (click here to view October 5, 2015 news release). The Bayan Khundii drill program is expected to consist of 12 to 14 diamond drill holes totaling 600 to 700 m. The program is targeting the Main Zone at Bayan Khundii, a 550 m by 300 m area that returned the majority of the high-grade mineralization encountered during the initial Q3 surface exploration program. The Company has also initiated a magnetic geophysical survey over the larger 1.4 km long Bayan Khundii target area, and gradient array induced polarization and dipole-dipole IP geophysical surveys over portions of the Main Zone. Results of the exploration programs are expected in December 2015. HALIFAX, NOVA SCOTIA--(Marketwired - Nov. 10, 2015) - Erdene Resource Development Corp. (TSX:ERD) ("Erdene" or "Company"), is pleased to announce that it has raised a total of $1 million from its recently announced non-brokered private placement ("Private Placement") and from the exercise of warrants. The Company completed the Private Placement announced on October 21, 2015 and accepted subscriptions for 6,864,327 units (Units") priced at $0.14 per Unit for gross proceeds of $961,000. Each Unit consists of one common share of the Company and one-half of one common share purchase warrant, with each whole common share purchase warrant ("Warrant") entitling the holder to purchase one common share of the Company at a price of $0.18 for a twelve month period from the closing date. Aggregate finder's fees of $45,500 were paid and an aggregate of 325,000 finder's warrants, with an exercise price of $0.15 for a period of twelve months, were issued to certain parties in connection with the Private Placement. All securities issued pursuant to the Private Placement are subject to a four month hold period from the closing date. Since announcing the Private Placement, the Company has also received subscriptions totaling $91,830 in connection with the exercise of warrants having an exercise price of $0.10 per share. Proceeds of the Private Placement will be used to advance the Company's Bayan Khundii gold prospect (discovered Q2-2015) and the Altan Nar gold-polymetallic project, as well as for general working capital purposes. At Bayan Khundii, the Company commenced a maiden drill program on November 8, 2015 as follow-up to the results reported on October 5, 2015 that included 30 m of 2.70 g/t gold from Trench BKT-01 (click here to view the Company's latest news release on Bayan Khundii). At Altan Nar, work is expected to include additional metallurgical process test work, evaluations of the mining, engineering, transportation, and marketing options, exploration and development related programs, and work required for a mining licence application (click here to view the Company's latest news releases on Altan Nar). HONG KONG, CHINA--(Marketwired - Nov. 9, 2015) - SouthGobi Resources Ltd. (TSX:SGQ)(HKSE:1878) (the "Company" or "SouthGobi") announces today the interim decision of the Ontario Superior Court of Justice (the "Court") deciding two preliminary motions in the Ontario class action (the "Action") claiming damages under the Ontario Securities Act and at common law arising out of the Company's restatement of financial statements as previously disclosed in the Company's public filings (the "Restatement"). On or about January 6, 2014, Siskinds LLP, a Canadian law firm, filed the Action against the Company, certain of its former senior officers and former and current directors, and its former auditors, Deloitte LLP, in the Court in relation to the Restatement. To commence and proceed with the Action, the plaintiff was required to bring preliminary motions to seek leave to commence the Action under the Securities Act (the "Leave Motion") and to certify the Action as a class proceeding (the "Certification Motion"). The Court rendered its decision on the Leave Motion on November 5, 2015. The Court dismissed the plaintiff's Leave Motion as against each of the former senior officers and former and current directors of SouthGobi named in the Action on the basis that the "large volume of compelling evidence" proved the defence of reasonable investigation on the balance of probabilities and provided the basis for dismissing the Leave Motion as against them. The Court granted the preliminary Leave Motion against SouthGobi on the basis that, at this stage, the plaintiff met the low legal standard of "reasonable possibility of success." In granting leave, however, the Court acknowledged the "... compelling evidence of the defendant company ... that may prevail at trial ..." The Court refused an award of costs for both the Leave and Certification Motions to the plaintiff. The Company firmly believes that it has a strong defence on the merits and will continue to vigorously defend itself against the Action through independent Canadian litigation counsel retained by the Company for this purpose. For more details in respect of the class action lawsuit, refer to the Company's Management Discussion and Analysis for the quarter ended March 31, 2014 available on SEDAR at www.sedar.com, and, in particular, the sub-section on "Contingencies - Class Action Lawsuit" of the "Regulatory Issues and Contingencies." VANCOUVER, Nov. 10, 2015 /CNW/ - Kincora Copper Limited (TSX.V: KCC) ("Kincora" or the "Company"). The Company announces that, in accordance with the terms of a $2,500,000 convertible note issued on July 19, 2012 (the "Note"), Kincora proposes to settle the interest due on the Note for the period July 20, 2014 to July 19, 2015 in the amount of $217,500 through the issuance of 4,350,000 common shares of Kincora at a deemed price of $0.05 per share (the "Debt Settlement"). The Note bore interest at a rate of 8.7% per annum, calculated and paid annually by way of the issuance of common shares of Kincora. All securities issued in connection with the Debt Settlement will be subject to a statutory hold period of four months plus a day from the date of issuance of the Shares, in accordance with applicable securities legislation. Closing of the Debt Settlement is subject to a number of conditions, including receipt of all necessary corporate and regulatory approvals, including the TSX-V.
VANCOUVER, BRITISH COLUMBIA--(Marketwired - Nov. 9, 2015) - Entrée Gold Inc. (TSX:ETG)(NYSE MKT:EGI)(FRANKFURT:EKA) ("Entrée" or the "Company") has today filed its interim operational and financial results for the third quarter ended September 30, 2015. Greg Crowe, President and CEO of Entrée commented, "In the third quarter, we were focused on preparing the updated Preliminary Economic Assessment for our Ann Mason Project in Nevada. In Mongolia, we are encouraged that the Government of Mongolia, Oyu Tolgoi LLC, Rio Tinto and Turquoise Hill Resources are making real progress towards restarting underground development. At the end of this third quarter, the Company maintains approximately US$25 million in cash, during what continues to be very challenging market conditions. We are continuing to look for strategic opportunities to create shareholder value, while taking steps to conserve our treasury, including staff layoffs and the implementation of cost cutting measures throughout the Company." Entrée continues to engage in discussions with Oyu Tolgoi stakeholders regarding the possibility of transferring title to the joint venture mining licences to OTLLC, as joint venture manager. Entrée has also been involved in ongoing discussions with stakeholders regarding issues arising from Entrée's exclusion from the 2009 Oyu Tolgoi Investment Agreement, including the fact that the Government of Mongolia does not have a full 34% interest in the joint venture property. With pre-start underground development activities in progress, the Company is hopeful that matters that affect Entrée more directly can now be resolved. Details of the Company's Interim Financial Statements and accompanying Management's Discussion and Analysis ("MD&A") for the quarter ended September 30, 2015 and its Annual Information Form for the year ended December 31, 2014 are available on the Company website, on SEDAR at www.sedar.com and on EDGAR at www.sec.gov. November 9 (MarketBeat.com) Turquoise Hill Resources (TSE:TRQ) had its price objective increased by Scotiabank from C$5.00 to C$5.50 in a research note issued on Monday, AnalystRatings.NET reports. The brokerage presently has a "sector perform" rating on the stock. Scotiabank's target price would indicate a potential upside of 44.36% from the stock's current price. In other Turquoise Hill Resources news, Director Jill Veronica Gardiner purchased 8,700 shares of Turquoise Hill Resources stock in a transaction that occurred on Tuesday, September 29th. The stock was acquired at an average price of C$3.36 per share, for a total transaction of C$29,188.50. Turquoise Hill Resources (TSE:TRQ) traded down 2.36% on Monday, reaching $3.72. The company had a trading volume of 600,773 shares. The stock has a market capitalization of $7.49 billion and a price-to-earnings ratio of 44.82. Turquoise Hill Resources has a 12 month low of $3.17 and a 12 month high of $5.80. The firm has a 50 day moving average price of $3.72 and a 200-day moving average price of $4.45. November 10 (MarketBeat.com) Brokerage firm Macquarie Upgrades its rating on Turquoise Hill Resources(NYSE:TRQ). The shares have been rated Outperform. The rating by Macquarie was issued on Nov 9, 2015. The company shares have dropped -13.50% from its 1 Year high price. On May 19, 2015, the shares registered one year high at $4.74 and the one year low was seen on Sep 28, 2015. The 50-Day Moving Average price is $2.85 and the 200 Day Moving Average price is recorded at $3.51. Institutional Investors own 29.83% of Turquoise Hill Resources Ltd. shares. Turquoise Hill Resources Ltd. has dropped 8.7% during the last 3-month period . Year-to-Date the stock performance stands at -5.16%. November 10 -- Pursuant to ASX Listing Rule 17.1, Xanadu Mines Ltd (Xanadu) requests a trading halt in respect of Xanadu's ordinary shares with immediate effect. (c) Xanadu is not aware of any reason why the trading halt should not be granted, or of any information necessary to inform the market or ASX about the trading halt. November 9 (MSE) Mongolian Stock Exchange organized 5 securities trading sessions and made transaction of MNT10.3 billion with daily average transaction of MNT2,066,964,279.40 in period between 02 November 2015 and 06 November 2015. 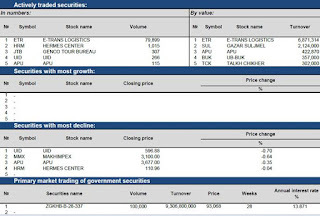 869,208.00 shares of 49 joint stock companies worth of MNT127,974,667.00 were traded. 100,000 Government retail bonds worth of MNT10,000,000,000.00 /10 billion/ traded through one trading session. 2,121 government retail bonds traded on secondary market of Government securities trading and total of 206,846,730.00 transaction has been made. 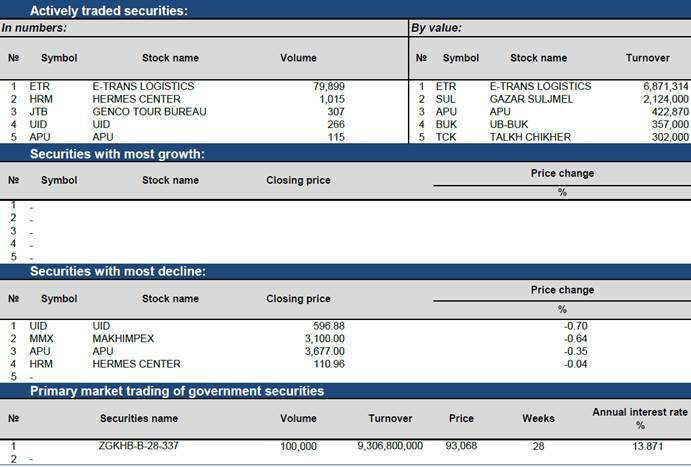 As of 06 November 2015, market capitalization was MNT1,290,676,738,200.00 which indicated decrease of 1.80% and MSE ALL index reached 913.27 units which indicated decrease of 2.24% from the previous week. November 10 (MSE) On 10 November 2015, the bond orders of 28 weeks Government bonds with 13.871% annual interest, placed on order book, and Ministry of Finance supplied 100,000 or MNT10.0 billion out of total order 309,906 pieces or MNT30.9 billion. November 9 (MSE) Dear investors, please be advised that the following government bond is about to mature. 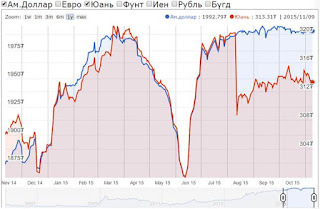 November 10 (MSE) Mongolian Stock Exchange introduced international capital market structure of Market Makers, designed to provide liquidity and volume to the market by constantly supplying both supply and demand into market since February 2015. On 09 November 2015, MSE's member "Novel Investment" LLC securities company received the ratification of "Market Maker" and signed agreement with Mongolian Stock Exchange. In last week, "Novel Investment" LLC participated the secondary market government securities trading and implemented 98 percent of trading of total 2,112 government bonds worth MNT206.8 million. November 10 (BoM) On the Foreign Exchange Auction held on November 10th, 2015 the BoM has received bid offers of USD 18.3 million in a rate between MNT 1990.50-1993.01, buying bid offers of USD 0.6 million in a rate with MNT 1997.00 and CNY 22.6 million in a rate between MNT 312.01-312.95 from local commercial banks respectively. The BoM sold USD 8.2 million in a rate of MNT 1992.50. On October 10th, 2015, The BoM has received USD Swap agreement buying bid offer equivalent to USD 38.375 million from local commercial banks and the BoM has accepted the offers. Ulaanbaatar, November 10, 2015 (World Bank) – Continued fiscal consolidation and sound monetary policies, along with a revitalization of foreign investment, are needed to help Mongolia weather external risks, the World Bank said in its latest Mongolia Economic Update. According to the newly released report, Mongolia's long-term economic prospects remain promising but the economy faces short-term challenges, with limited policy buffers to address imbalances in the economy and debt repayments beginning in 2017. With the possibility that external risks in commodity markets and growth of trading partners, the report said it was important that the Mongolian government stay committed to its policy reforms. "The measures that the Government has taken over the past year were necessary to strengthen the resiliency of the economy and reduce the balance of payments risks. At the same time, falling commodity prices and other risks call for further efforts," said James Anderson, World Bank Country Manager for Mongolia. "The key to a successful adjustment of the economy is to ensure the credibility of policy adjustment. Maintaining reform momentum and a stable investment environment is needed to build a solid footing for stable and sustainable growth, while girding against possible shocks." Economic growth slowed to 3.0 percent in the first half of 2015 amid declining exports from a continued weakening of the commodity market and slower growth in the key export market of China. Mongolia's annual GDP growth is expected to slow to 2.3 percent for all of 2015, the report said. "The revised forecast reflects weaker crop harvests and slower industrial production data in the third quarter," explained Taehyun Lee, World Bank Senior Economist, who said growth could slow further in 2016. "Mining production is expected to decline in 2016-17 amid the weak commodity market conditions. The non-mining sector of the economy will likely remain weak in early 2016, but a recovery in foreign investment would support the industries supplying goods and services needed for large scale mining investment projects." The report noted that while growth has slowed, subdued domestic demand has contributed to a significant improvement in the current account balance and to lower inflation. The current account deficit is expected to narrow to around 5 percent of GDP this year, from 11.7 percent last year. A recovery in foreign investment would help policy reforms get implemented with fewer adverse consequences and would also mitigate the balance of payments risk. Revitalizing foreign investments would require implementing stable and predictable policies and regulations on investment, the World Bank report said. The World Bank acknowledged the commitment of the government to policy reforms, but urged the country to continue and deepen those reforms. These include the fiscal consolidation efforts, reducing the budget deficit, drawing on realistic revenue projections and in line with the Fiscal Stability Law, and consolidating off-budget expenditures. It also suggested that including the commercial portfolio of the Development Bank of Mongolia would strengthen the credibility and the effectiveness of the fiscal consolidation plan. Quasi-fiscal programs financed by the Bank of Mongolia, the report argued, should be phased out and transferred to the government. A monetary policy that is focused on reducing external imbalances, combined with a flexible exchange rate, would help ease underlying pressures on the exchange rate and safeguard foreign exchange reserves, the report said, thus helping the economy better absorb shocks. In a special section analyzing Mongolia's social welfare transfer programs, the report found that the programs are relatively generous compared to other countries. The report presented options for further strengthening the social welfare programs, making poverty reduction a key objective. Mongolia's poverty rate declined from 27.4 percent in 2012 to 21.6 percent in 2014, although many remain near the poverty line. November 9 (Mongolian Economy) In our latest magazine issue focusing on fiscal and monetary policy includes an interview with "Pride of Mongolia" Dorjkhand Togmid, Advisor to the Executive Director for Asia and Pacific at the IMF; a report of the World Bank; and Managing Director of the IMF Christine Lagarde's speech. In addition, you can read in this issue an interesting interview about the production of value-added goods with the Director of "Mon-Lans" LLC, D.Baasan, as well as article about the newly amended draft law on labour. Thus, we recommend that you read the five must-read articles from the first November issue of "Mongolian Economy" magazine. ... The reason for adopting a budget with a deficit in the trillions is to expand the budget. Budget investment has an important role in the development of infrastructure, something that currently hinders Mongolia's general level of competitiveness. However, according to quantitative indicators, inflation rose in years when the budget was increased and, in contrast, decreased when the budget was tightened. Fiscal expansion takes place especially in election years, alongside high inflation rates of 10 to 20 percent. 3. What is Happening around the Khalkh River? ... Mongolian usually approach issues with a level head, but this process was carefully planned and politicized from the beginning, as a usually calm people insulted a minister so scathingly. Ordinary citizens were surprised by such a harsh insult. · Justice Coalition Meeting in Hall C.
November 10 (GoGo Mongolia) Plenary session is scheduled for today. Ulaanbaatar, November 9 (MONTSAME) Regarding the submitted draft law on making changes to the Constitution of Mongolia, N.Batbayar MP also presented on November 6 the draft resolution on running public referendum in order to decide discussing of constitution amendments by Parliament. The draft resolution proposes to hold the public referendum on November 26. Constitution of Mongolia indicates that state power shall be vested in the people of Mongolia, the people shall exercise state power through their direct participation in state affairs as well as through the representative bodies of state power elected by them (3.1); and that a national referendum on constitutional amendment may be held on the concurrence of not less than two thirds of the members of the State Ih Hural, the referendum shall be held in accordance with the provisions of article 25 paragraph 1, sub-paragraph 16 of the constitution (68.2), pointed out the MP on the motives to develop this draft. On November 26 of 1924, then-People's Republic of Mongolia adopted the country's first constitution. Mongolia's first and only public referendum took place 70 years ago on October 20. Ulaanbaatar, November 9 (MONTSAME) Draft law on making amendments to the Constitution of Mongolia was presented to the Chairman of the State Great Khural (Parliament) Z.Enkhbold by the head of working group for developing amendments to the Constitution N.Batbayar MP, last Friday. The current Constitution was adopted on January 13 of 1992, and was amended on December 14 of 2000. First amendments to seven articles have been facing some serious criticisms. "Issues have risen as the country's development advances that require new management over the interaction, coordination and pro-action between the state powers and authorities", said N.Batbayar MP. The draft suggests increasing the number of Parliament members from 76 to 99, lengthening the term for Cabinet and Parliament from four years to five years and the term for President to four years to six years. It also proposes to exclude political parties' participation from the elected posts in citizens' representatives khurals, and to involve Cabinet in the processes of forming Constitutional Court and appointing Prosecutor-General. Also, other changes were proposed through the draft in order to reduce duplications of responsibilities. If adopted, the Constitution would regulate that President shall not be elected by the citizens, and shall be appointed by Parliament (Mogi: enlarged parliament with local governors). This draft has been supported by 47 MPs or 61.8 percent of parliament, comprising representatives from the Democratic Party, Mongolian People's Party, Civil Will and Green Party, Justice coalition and independent MPs. Moreover, a national referendum will be held prior to discussion at the plenary session of the Parliament and it is cited in the draft amendments to hold the national referendum on November 26, the date when Mongolia's first constitution was adopted in 1924. In case the draft amendments to Constitution are publicly approved, this Parliament will be likely to disband before the term ends, leading to early parliamentary election. November 9 (Mongolia Focus) It appears that all of a sudden the push for constitutional revision is alive and becoming more concrete with a multi-party submission of a draft in parliament that appears to have the support of 60% of MPs. It appears that some of the proponents are hoping to organize a referendum (based on proposed revisions to the law on referenda) on changes to the constitution in time to be able to make these changes before the six-month deadline for the election law, as well as a provision in the constitution that changes have to be enacted at least six months before the next election. Below is my quick summary of proposals for constitutional change based on the parliamentary draft as summarized by news website ikon.mn. 2. president to be elected by a combined vote of heads of provincial assemblies (amaig khural) and parliament members. This appears to be similar to the German Bundesversammlung that elects the (largely ceremonial) federal president (who just visited Mongolia recently). 3. The government is made up of nine ministries: finance, interior & justice, foreign affairs, nature & development, defense, education, health & social development, agriculture, and infrastructure. 4. The prime minister can name an additional three ministers without portfolio to cabinet. 5. The prime minister would name cabinet, but ministers would not be subject to parliamentary approval. 6. Darkhan and Erdenet would be given special status as cities different from aimags. 7. The State Great Khural would be expanded to 99 members from the current 76. 8. The State Great Khural would serve for five years (rather than the current four). There are additional specifics in the parliamentary draft pertaining to the PM's involvement in appointing judges and the state attorneys, and the governors of aimags and soums. These proposals appear to address some of the long-standing challenges built into Mongolian democracy, especially the unclear status of presidential vs parliamentary power, and would turn Mongolia into more of a parliamentary democracy, rather than keeping elements of a presidential system. That clarification would most likely be useful and productive. The president would be reduced to a largely symbolic role as heads of state have it in Westminster democracies or some continental European versions (such as the Federal Republic of Germany). Some of the proposals speak to issues that have captivated Mongolian debates, even though it is not always clear to observers why these issues are so important. An example would be the "double deel" concern that has animated political discussions for the past two years. Other proposals may just take the occasion of constitutional change to also implement an update, for example recognizing the growing role of Darkhan and Erdenet as cities. These revisions strengthen the prime minister's position quite significantly and it is not clear to me, for example, why appointment of aimag governors should shift from the aimag assemblies to the prime minister. Surely, many of these specifics will be debated in parliament in coming weeks. As the draft has been submitted by a multi-party group of parliamentarians, it seems like it should be taken seriously as an initiative toward constitutional revision. Also, since Pres. Elbegdorj is on his second and thus final term as president, he has little to loose personally from a reduction of presidential power. Under other scenarios a sitting president might be unlikely to support a shift towards a parliamentary democracy. If the changes were to be enacted as proposed, Elbegdorj, will have been the last powerful president. The constitution (according to its Chapter 6) can be changed either by a 3/4 majority of all members of parliament (i.e. 57 MPs), or by a 2/3 majority a popular referendum can be initiated. If a majority of eligible Mongolians participates, and a simple majority of those participating approves the changes, these changes are enacted directly (Art. 25). November 10 (news.mn) Yesterday, a meeting of the Democratic Party Group took place, following which the Director of the State Structure Standing Committee, A.Bakei made a press statement in which he said: "The draft of the "United Electoral Law" is to be implemented completely. An important aspect of the draft law is to integrate all elections, whether presidential, parliamentary, or of local representatives under the one harmonized structure. Three kinds of draft electoral laws are being presented to Parliament which we are aiming to discuss from tomorrow (today, 10th November)". · The current proportional system will be maintained. · Voters do not need to bring their passports (Mogi: probably means ID cards), because of the "smart fingerprint registration" system. · If any re-run is necessary, it must be organized twice; firstly, on the last Sunday of June and, secondly, on the first Sunday of October. · The name of the Electoral Division Commission will be changed to the "Organizing Unit for voting and counting polls". The unit should consist of one chief organizer and 5-7 members. · The solution period of any electoral debate must not exceed 60 days. · The campaign activities of the election must be legalized with the minimum expenses. · The Mongolian National Audit Office will announce the maximum expense of the election to the public, not the General Electoral Commission. · The amount of election financing will be changed; a member of the public can donate up to MNT 3 million, whilst a legal body can contribute up to 15 million. November 9 (infomongolia.com) Minister for Health and Sports G.Shiilegdamba sent a petition regarding his arrest to Prime Minister Ch.Saikhanbileg on November 06, 2015. His petition says: "I have not committed any crime and I am sure that the state court will prove it. However, it is going to take long time until court proves me innocent judging the current situation. I believe that I have become a victim of planned political ploy. Therefore, I have decided to resign from the position of Minister for Health and Sports and member of the Government as I do not want to harm the reputation of my colleagues who stand on the protection of health of Mongolian people day and night. I humbly ask you to accept my request. Moreover, I would like to thank "Justice" Coalition of MPRP - MNDP, which proposed me for the position of Minister for Health and Sports, and Prime Minister Ch.Saikhanbileg, President Ts.Elbegdorj and the Parliament, who accepted me. I believe that I will meet you next time with honor." Ulaanbaatar, November 10 (MONTSAME) The cabinet discussed Monday draft resolution on adopting State Comprehensive Policy on Population Development, and resolved to submit it to parliament. As of 2014, people aged 0-14 make up 28.1 percent of total population of Mongolia, aged 15-59 cover 65.7 percent, and 6.2 percent is made up by people aged above 60. It is a perspective that activity rate in the population will be high in the next decade. However, it is also expected that the portion of women of reproductive age is to decrease over the years, and will result in increase of portion of above 60-year-old people in the population threefold. The State Comprehensive Policy has an aim at ensuring sustainability in population growth, facilitating the population with favorable environment to live creatively and to develop, and to improve the quality of families' lives. The document, by creating conditions that encourage birth, is expected to help stabilize the population growth, maintain long-term favorable age distribution, efficiently prepare a rapid aging of population. The document also issues of creating favorable conditions for people for living in their own hometowns and of regional development, in order to reduce migration, caused by lack of jobs and socio-cultural services. Ulaanbaatar, November 10 (MONTSAME) The State Great Khural (parliament) ratified the credit agreements of Government of Mongolia and Asian Development Bank on program of supporting social welfare and on additional funding for the project on agriculture and rural development at the plenary meeting of November 10. Finance Minister B.Bolor read the introductions of the agreements. In frames of implementing the measures for overcoming economic difficulties, the Government requested support from the ADB in order to diminish the negative impact of the current economic decline on the vulnerable strata. The Bank accepted the request and resolved to make two separate installments of credit worth 150 million US dollars in 2015 and 2016. The program of supporting social welfare will complete on December 31 of 2016. The bill on ratifying this credit agreement was backed with 83.1 percent approval of MPs. Agricultural and rural development project has been involving providing assistance to many farming cooperatives, with an aim to promote herders and cooperatives which are main suppliers of agricultural raw materials. The project's first phase has allocated 176 incentives to 104 cooperatives that is worth 1.46 million USD, so far, being implemented in 38 soums of six aimags. It has also given 23 types of training to more than 4,300 people. In collaboration with commercial banks, the project also allowed credits of 22.3 million USD or 29 billion MNT to 12 newly established businesses, and created 1,854 jobs. The second phase of this project needs additional funding of some 50 million USD, in order to continue its actions toward improving value-added production's network in Mongolia. The credit agreement between the Government and ADB on additional funding for phase two of Agricultural and Rural Development Project was backed by 84.5 percent. November 9 (Mongolia Metals & Mining) During TV25 interview on Nov 2, Parliament Chairman Z.Enkhbold has said that TT mine matters better to be decided next spring after south and east TT railroads are built and sales & distribution established. He also said that funding is available, for example, JBIC could finance construction of east TT rail and Mongolians can & should construct the railroads themselves, for example, Darkhan Metallurgical Plant said it could build the actual rails for TT railroad, Mongolia has workforce, raw construction materials, engineering expertise to build TT rail and there is no need to wait for foreign investor to come and build it for Mongolians. He elaborated that disciplined workforce of new young army recruits could build the roads and get paid possibly monthly sum of something like MNT500,000 per month, which they would receive in bulk after dismissal from the army. - SOE Mongolian Railways to own not less than 51% of company to own concession on BOT basis for new rail road structure. The Secretary has supported the proposed bill , saying 51% state stake is reflected in election platform of the party. As for how funding for 51% state stake, the Secretary has said that Chinese side has said "You Mongolians, first of all sort out matters between yourselves. After that we are ready to cooperate with you." According to interview published 5 days ago, MP Kh.Battulga (DP) maintains that arrest of Mr.Batzaya, "his team member , in whom he has full trust, is one step in PM's power ambition to become DP Chairman and next step is get TT the way PM's group such as Minister Enkhsaikhan and MMC shareholder G.Batkhuu wants, to selectively mine TT. The 40 MP-s signed bill is unprecedented and investors in general agree to it, now it is up to Govt to introduce version and move TT forward. There will be money to build railroads. Over 20-30 youth have worked on railroad project with Mr.Battulga and over 600 young Mongolians have worked on associated development projects, including youth, who worked in Japan, USA, where they received monthly US$25,000 salary. Yet they are being repressed that they colluded with Mr.Battulga and Samsung CT and stole from US$200m allocated from Chingghis bonds on TT railroad and arrested for political reasons. So disillusioned they went back abroad , why should they come back to motherland that represses them. These youth include department director Ganbat Chuluunkhuu and ex-CEO of Mongolian Rail Ways Bat-Erdene. Mr .Battulga is against Govt resignation but PM's push for resources harms Mongolia. Sucide of deputy director of Shenhua indicates that he would not have commited suicide that wrong thing was not done. News.mn has reported today that Economic Crimes Unit of Criminal Police has filed criminal case, arrested and have taken into custody as suspects Mr.B.Batzaya and management of Samsung CT corporation , the TT rail general contractor. Other suspects include director of Liberty Partners Ch.Ganbat, who is wanted by Interpol because he is abroad, and deputy director of Mongolian Railways P.Bat-Erdene. According to Interpol, Mr. Ganbat Chuluunkhuu is wanted by judicial authorities of Mongolia on charges of Appropriation of Property by Fraud and Money Laundering. According to Liberty Partners, "specialized structured commodity and project finance house in Mongolia", "the founder and the Managing Director of Liberty, Mr. Ganbat Chuluunkhuu was working in the Structured Commodity and Project Finance team of Commerzbank AG New York Branch until the summer of 2009, when he was approached by the then-called Minister of Road, Transportation, Construction and Urban Development of Mongolia ("MRTCUD") to provide professional assistance in regards to the development of infrastructure and industrial projects in Mongolia." "In an article dated May 15th, 2014 published by Mongolian media outlet "Morning News" ("Article"), it accuses Liberty of misconduct and further attempts to cast doubt on Liberty's integrity with purported reference to the awarding of an Advisory Contract (see below) in 2011. Liberty absolutely rejects these accusations contained in the "Article" and views these baseless accusations as a clumsy attempt to undermine Liberty's credentials, obscure the true facts, attempt to demean and bring into question the accomplishments of Liberty in the minds and face of public and Liberty's partner organizations. November 9 (news.mn) Following the approval of the Amnesty Law, many prisoners are being released. The leader of the "Ongi Gol" Movement, Ts.Munkhbayar has been released from a prison located in Kharhorin in Uvurhangai Province. Ts.Munhbayar was sentenced to 7 years for entering the territory of the Government House with a gun and opening fire. On Friday 6th the General Executive Agency for Implementing Court Resolutions released some 125 prisoners from prisons 409 and 55. "Investing in people brings the highest returns. This needs to be the policy of the Mongolian government." November 9 (business-mongolia.com) Dorjkhand Togmid was born in Ulaanbaatar in 1977. After graduating from Ulaanbaatar Secondary School number two, he went on to study public finance in the National University of Mongolia. He earned his master's degree in public policy and economic theory from Hitotsubashi University in Japan. In 1999, he began his career at the Ministry of Finance's Fiscal Policy Department as a specialist and worked there for 15 years. He held various positions: Specialist at Procurement Policy and Coordination Department of the Ministry of Finance, Deputy Head of the Policy Coordination Office of Financing and Aid, Head of the Project Finance and Debt Management Office, Director General of the Department of Financial Policy and Debt Management, Trainee at the National Tax Agency of the Ministry of Finance of Japan, government procurement consultant at the ADB, Programme Coordinator at the Central Asia Regional Economic Cooperation of the ADB and Coordinator of the UN's "Greater Tumen Initiative." Since 2013, he has been working as an Advisor to the Executive Director for Asia and the Pacific at the IMF. In addition, he also studied financial theory and project financing at the Harvard and Oxford. Q: Several Mongolians work at the World Bank and IMF. However, I understand that you are the first Mongolian to hold an administrative position at such a global financial and economic organisation. Why did choose to work in this organisation, and what requirements did you need to meet to get this position? A: I am not sure whether that many Mongolians have worked for the IMF. However, several Mongolians worked at the World Bank. It is an open field in which anyone can work if the desire and ambition are there. As for me, I had dreamt of working at this organisation since I started working at the Ministry of Finance in 1999. At the time, I used to cooperate with IMF economists on many policy solutions when they came to Mongolia. Frankly, we learned much from them also. As for this position's requirements, they require professional criteria, such as knowledge of economic theory, experience developing policies and a possibility to represent one's own and regional countries. Also, they see whether you have previously worked in other countries, and knowing a languages other than English is advantageous as well. Generally, you have to meet all the general criteria set by international organisations. Q: Working on an administrative level in an international financial organisation that regulates monetary relations will naturally give invaluable experience and knowledge. What kind of experience and knowledge have you obtained from there? A: I gained a lot of experience and knowledge by working at the headquarters of the IMF. I hope that any and all interested Mongolians work here. Many international experts and researchers work here because it is an organisation that aims to ensure global financial and economic stability. It is a firmly established organisation. The advantage of working here is that solid information about nations' economies, research facilities and archives are rich and open to the employees. Thus, 95 percent of the organisation's economists have a Ph.D., and all of them are people who have conducted their own research and have experience developing policies. In addition, Nobel Prize-winning economists and world-renowned university professors regularly come to give lectures and hold debates. As for me, I mainly work on policy documents being discussed by the Board of Directors and on economic assessments of member states. I came upon some interesting results when I compared policy mistakes and successes of resource-rich countries like Mongolia. For example, the IMF has 188 member countries and provides economic assessments to these countries annually. About 45 countries of the member countries have significant natural resources, and most of them are developing countries that depend on mineral exports. There are many examples of economies of some these nations being tarnished because of political instability, weak governance, incompetence and indulgence of populist promises by ruling parties. Sounds familiar, right? The main point is that there are many countries that have bitter stories similar to Mongolia. We need to simply read, learn and study about them to develop a policy. Q: You worked at the Ministry of Finance for more than ten years. Would you tell us more about the first time you started working there? A: I am a Mongolian person who was born in Mongolia and raised around livestock. When everyone was avoiding government jobs during the transition period, I went on to work as a specialist at a state ministry. I am one of the guys who was overburdened by work and had to work 18 hours per day. I have always taken pride in that. On my first day of work, the Head of the Fiscal Policy Department, Dashdorj, told me, "The Ministry of Finance will not pay you that much. Don't even think about being provided with housing, and you will not even have time to get married. All you're going to get is work." It was true, and I was overwhelmed with work as soon as I entered the job. When it came time to make the budget, I slept at the office for two months. I truly experienced for the first time what it is like smell awful, having not showered in a long time. I realized my dream of working at the IMF by not losing my thirst for knowledge when starting my career at such a ministry where work never stops. Q: When will your term of work at the IMF end? When will you come back to Mongolia? A: As for contract terms, it can be extended by 2 years after initial expiration. For me, my first contract will expire pretty soon. I am thinking of coming back to Mongolia without extending my contract. I am very happy to see many educated youth joining forces to serve their country. I will go back to Mongolia and join forces with those young people to contribute what I can to the country . When I asked him about his hobbies, he said he enjoys any sport with a ball, especially basketball. He also said that he likes playing chess and checkers, going hiking, familiarising himself with multi-ethnic cultures, reading refreshing books and watching movies. After going to the US, he developed the new hobby of making food for his children and grilling meat for guests. Pushing 40 years old, T.Dorjkhand is a father of four children, and says he does his best to fulfill his fatherly duties. Ulaanbaatar, Mongolia, 9 November 2015 (Oyu Tolgoi) Oyu Tolgoi today announced an update on its performance for the third quarter of the fiscal, ending 30 September, 2015. · Oyu Tolgoi achieved a strong safety performance with an All Injury Frequency Rate of 0.31 per 200,000 hours worked for the nine months ended 30 September, 2015. · Oyu Tolgoi recorded revenue of US$431.7 million in Q3'15 on sales of 226,000 tonnes of concentrate, a 2.5% increase over Q2'15, reflecting higher sales volumes partially offset by lower copper prices. · Oyu Tolgoi's Q3'15 mine production was at record levels while concentrate produced and contained copper were on par with Q2'15 even considering the planned concentrator shutdown in July 2015. · Copper in concentrates for Q3'15 increased 1.3% due to higher head grades while gold in concentrates decreased 48.3% over Q2'15 due to slower than anticipated access to gold-rich ore.
· Increased copper and gold production is expected in Q4'15 compared to Q3'15 as higher-grade ore is accessed in the open pit. · Underground pre-start activities are underway in parallel with an update to the feasibility study capital estimate, which is expected to be completed in Q1'16. · Sales contracts have been signed for more than 80% of Oyu Tolgoi's expected 2016 concentrate production. · Turquoise Hill continues to expect Oyu Tolgoi to produce 175,000 to 195,000 tonnes of copper and 600,000 to 700,000 ounces of gold in concentrates in 2015. · Turquoise Hill continues to expect signing of project financing by the end of 2015 and the decision for underground construction in early Q2'16. Safety continues to be a major focus throughout Oyu Tolgoi's operations and the mine's management is committed to reducing risk and injury. Oyu Tolgoi achieved a solid safety performance with an All Injury Frequency Rate of 0.31 per 200,000 hours worked for the nine months ended 30 September, 2015. Revenue in Q3'15 increased 2.5 per cent over Q2'15. Higher revenues reflect higher volumes of copper-gold concentrate sales, partially offset by a fall in copper prices. The Q3'15 mix of revenue by metals is the result of inventory with higher contained copper and gold drawn down during the quarter from concentrate produced in Q2'15. Gross margin at 41.6 per cent for the quarter reduced from 46.4 per cent in Q2'15 due to the effect of lower copper prices. Andrew Woodley, President and CEO of Oyu Tolgoi, said: "Our foremost priorities remain safety and productivity, and we have delivered real progress with a strong safety performance and record production over the quarter. More recently, the success of the Underground Development Supplier Forum, held in Ulaanbaatar on 4 November, underscored Oyu Tolgoi's potential – and our commitment to deliver a world class sustainable and competitive copper business." Oyu Tolgoi's Q3'15 mine production was at record levels while concentrate produced and contained copper was on par with Q2'15 even considering the planned concentrator shutdown in July. During Q3'15, mined production increased 8.5 per cent over Q2'15 due to shorter hauling routes and ongoing productivity initiatives. Copper in concentrates for Q3'15 increased 1.3 per cent due to higher head grades. Gold in concentrates for the quarter decreased 48.3 per cent over Q2'15 due to slower than anticipated access to gold-rich ore.
November 9 (news.mn) Mongolia plans to use and promote Mongolian products and services at "ASEM-2016". In this connection an exhibition called "Mongolian Brand ASEM-2016" opened in the exhibition hall at Misheel Expo on Friday 6th. Approximately, 120 national manufacturers are promoting their products, for example: handmade items, souvenirs, textiles as well as packaging. The exhibition ends on Monday 9th November. Ulaanbaatar, November 9 (MONTSAME) A.Tleikhan MP visited Salkhit Wind Power Plant November 7 to get acquainted with the activities of Mongolia's first wind park that is operating on turbine generators supplied from General Electric. The wind park, located in Sergelen soum of Tov (Central) aimag 75 km from Ulaanbaatar, was commissioned in June of 2013. The plant is based on 1.6 MWT capacity 31 turbine generators, annually reducing the greenhouse gas emission by 180 thousand tons and saving 1.6 million tons of water and 122 thousand tons of coal. This environmentally friendly power source supplies 50 MWT electricity to the Central energy system, informed the CEO of Clean Energy LLC Ts.Sukhbaatar. A.Tleikhan MP underlined that Salkhit plant has made huge progress in comparison with the last year, to which greatly attributed newly adopted Law on Renewable Energy and the State Policy on Energy. The world is putting away coal as energy source and turning to more clean sources as solar, hydro and wind powers. "Mongolia should do the same", he noted. Will China postpone import of meat? November 10 (news.mn) In June 2016, Mongolia planned to export 128 thousand tons of meat. During the Mongolian and Chinese exhibition, China made a contract to import CNY 6 billion's worth meat of meat. In relation to this, a Chinese quarantine evaluation team has been working in Mongolia for ten days. The team outlined the export and import conditions and standards required at the meat processing plants. Unfortunately, after their return to China, there was an outbreak of an infectious livestock disease in Bayan-Ulgii Province. Therefore, China might postpone the meat export by one year. November 9 (news.mn) In the framework of "Ulaanbaatar Welcomes You", the City Administration, the City Authority of Physical Training and Sport, and Mongolian Cycling Federation organized a "Cycling Marathon" which began at 11.00 am on 7th November. The participants cycled an approved 8 kilometer circuit from Chinggis Square-Peace Bridge-Zaisan-Ikh Tenger-Marshall Bridge-and National Park. Also, an "Extreme Trial" took place on the square of Police Monument in the National Park on 8th November. Xi says China-Mongolia relationship at "historical best"
BEIJING, Nov. 10 (Xinhua) -- Chinese President Xi Jinping held talks with his Mongolian counterpart Tsakhiagiin Elbegdorj on Tuesday, saying the current bilateral relationship is the "best ever" in history. "China and Mongolia are good neighbors, good friends and good partners," Xi said during talks with Elbegdorj at the Great Hall of the People. Invited by Xi, Elbegdorj is in Beijing for a state visit to China from Monday to Wednesday. It is Elbegdorj's second trip to China this year. The Mongolian president visited Beijing in September to attend the commemoration marking the 70th anniversary of the victory of Chinese People's War of Resistance against Japanese Aggression and the World Anti-Fascist War. "The development of the comprehensive strategic partnership between China and Mongolia is in the common interests of the two sides and has won support from the people of both sides," Xi said during Tuesday's talks. The two countries decided to establish the partnership in August 2014 after Xi made a state visit to Mongolia. "The Chinese side attaches great importance to ties with Mongolia and the bilateral relationship is always put in an important place in China's neighborhood diplomacy," Xi said on Tuesday. Xi said China respects Mongolia's independence, sovereignty and territorial integrity as well as the development path chosen by the Mongolian people on their own. As China and Mongolia have reached consensus on conjoining China's Silk Road Economic Belt initiative with Mongolia's Steppe Road plan, Xi suggested the two governments discuss an agreement while pushing ahead with concrete projects. The Steppe Road plan is an infrastructure construction proposal aimed at boosting the Mongolian economy through trans-border transportation. Xi also called for early completion of the outline of a China-Mongolia-Russia economic corridor. Elbegdorj said the Mongolian side gives priority to the friendly relationship with China in its foreign policy and is ready to increase interactions with China in multiple areas to enhance mutual trust and reciprocal cooperation. Mongolia is committed to the development of the comprehensive strategic partnership, Elbegdorj said, expecting his visit to further promote the bilateral relationship. Mongolia values trilateral cooperation with China and Russia as well as China's stance in international affairs and is willing to step up communication and coordination with China, according to the visiting president. After the talks, the two presidents witnessed the signing of a string of cooperation documents. Prior to the talks, Xi held a red-carpet ceremony to welcome the Mongolian president. Ulaanbaatar, November 9 /MONTSAME/ Mongolian President Ts.Elbegdorj left Ulaanbaatar today to pay a state visit to the People's Republic of China, as invited by the President of China Xi Jinping. The visit will complete on November 11. The President will hold official talks with his counterpart, and receive Zhang Dejiang, the Chairman of the Standing Committee of the National People's Congress, and Li Keqian, the Premier of the State Council of the People's Republic of China. Ulaanbaatar, November 9 (MONTSAME) The Chairman of the State Great Khural (parliament) Z.Enkhbold Satursday received a delegation headed by Ms Anneli Jaatteenmaki, a Vice President of the European Parliament (EP) and former Prime Minister of Finland. The EP's delegation took part here at the Forum of Asian Liberal and Democratic Parties which was concluded on Sunday in UB. Expressing thanks to the Speaker for an audience, Ms Jaatteenmaki noted that the Council of Asian Liberals and Democrats (CALD) is a member of the Liberal International (LI), and that Mongolia's Civil Will-Green Party joined this organization in 2011. The Mongolian party is chairing the LI in 2014- and 2012, Ms Jaatteenmaki noted. The CALD forum brought together representatives of 12 countries, including Sam Rainsy, a politician from Cambodia; and Mr Emil Kirjas, the LI secretary-general. Present at the meeting were also Ms S.Oyun MP, the chairwoman of the Civil Will-Green Party; and other officials. Ulaanbaatar, November 10 (MONTSAME) On Monday, the cabinet of ministers discussed the results and outcomes of the state visit of the Federal President of Germany Joachim Gauk, paid this October 14-16. It was underlined that, during this visit, deals were made on supplying copper concentrate, establishing strategic partnerships between Mongolian and German steel producing companies, and on founding a factory of lubricates. The German President met with the Mongolian Prime Minister Ch.Saikhanbileg and exchanged views on the bilateral relation issues. The PM expressed Mongolia's interest to cooperate with Germany not only in minerals' sphere, but also in industry, education and tourism. Mongolyn Alt Corporation (MAK) signed Memorandums of Understanding on supplying copper concentrate from Tsagaan Suvarga project to Aurubis AG, and on tying strategic partnership with Ferrostaal. These reviewed results will be submitted to the National Security Council by the Minister of Foreign Affairs L.Purevsuren. November 9 (news.mn) Approximately, 297,000 cars have been registered so far in 2015, which represents an average annual increase of 30,000 since 2009. This is reflected in the sharp rise in traffic jams. Another negative factor is that 77% of the total cars on the roads are more than ten years old; 19% are 4-9 years old. A report has been produced based on data from fourteen air monitoring points. This shows that the highest nitrogen dioxide pollution level is at the central crossroads, where traffic has congestion is particularly serious. Pollution is worst of all at the western crossroad in the 13th micro region. November 10 (gogo.mn) The Minister of Education, Culture and Science L.Gantumur was given a right to establish cooperation agreement on behalf of the Government with the Massachusetts Institute of Technology (MIT) in order to support development of higher education and to develop entrepreneurship innovation in science sector. MIT was established in 1861 as 81 graduates of the MIT were awarded Nobel Prize. It has been leading the QS list for the last three years, which determines the world's top universities. 15 students from Mongolia are studying at the university, which has 11.000 students, more than 1000 professors and 800 teachers as of today. Minister of Education, Culture and Science L.Gantumur submitted an official letter proposed to cooperate in higher education and science sectors to the President of MIT. Minister of Education, Culture and Science L.Gantumur and Vice President of MIT Claude Canizares have mutually agreed to sign memorandum of cooperation, conduct joint research, cooperate with professors on training and technical direction and work as guest teacher. The Government to sign Memorandum of Cooperation with MIT on November 15-20, 2015. Ulaanbaatar, November 10 (MONTSAME) At its regular meeting of Monday, the cabinet approved the issues of drafts of "Program of Cooperation in Education, Culture, Science and Sports in 2015-2018 between governments of Mongolia and the Republic of Italy", "Intergovernmental Program of Cooperation in Education, Culture and Science between Mongolia and Romania", and "Intergovernmental Agreement on Education, Culture, Science and Technical Cooperation between Mongolia and the Republic of France". By signing of the cooperation program with Italian government, the sides will expand a coperation in education, culture, science and sports, and will exercise professors/scholars exchanges in all fields of study. The two countries are expected to implement joint academic projects, and organize events for safeguarding cultural heritage. In France, more than 140 Mongolians have received training and education since 1996. As of 2014, over 100 Mongolian students are studying in France, of which 10 have been granted French government scholarships. In the scientific field, Mongolia-France joint archaeological expedition started in 1993, and commenced studies on Hun Empire "The First Empire of Steppe", holding excavations and researches in 55 historic landmarks. The French side has conducted remediation works of 200,000 EUR on more than 200 historic findings, and handed the latter to Mongolia. The original video of "Tsogt taij" film, one of the outstanding screen works of Mongolia, has been improved in France. November 9 (gogo.mn) It has been a while since we last featured someone in "Ubiers". Now we are back. This time, we interviewed the guy who has profession of "an explorer" in the countryside of Mongolia. But his exploration activities do not end in the countryside. He also loves to explore in the sky. So, let us know who he is and how he explores both on the ground and in the sky. Lets start a simple question with our interview. Do you enjoy living in Mongolia? Oh yeah, I have been living almost 6 years now. It is already home, actually place where I have lived for the longest since leaving my parents' house, which was almost 20 years ago. How long do you plan to stay more here? I do not have an end plan; I am just here until life changes. I am pretty good at entertaining myself. I do not think I am getting bored. If anything, I am getting more interested in Mongolia. Was it easy or difficult to socialize and make friends at first? I found Mongolia very friendly. When I first came here, I actually did not have any expat friends. All of my friends are Mongolian, mostly from workplace at first. Then, I was going out and making Mongolian friends gradually. But, for last two years, I started to know and making friends with real expats. It is backwards compared to others. Please tell us more about yourself and your job? I came here in May, 2010 to start the job with a small oil company. I am geologist. I mostly work in Gobi-Altai, Bayankhongor and Uvurkhangai provinces. We have been working for 5 years and hopefully, we are expected to try first drilling for oil in coming years. It is huge project; our block is 700 km wide and 200 km long. It is actually as same size as Ireland. I need to walk a lot because of my job. That is interesting part of it. Most expats live in the city. I think I am very lucky spending a lot of time in countryside and got to know certain parts of the country very well, which keeps me really interested. Then, I come back to Ulaanbaatar in winter. Being able to spend few months out there in countryside breaks up the year and makes it interesting. I always like coming back to the city after spending few months in the countryside. UB is a great city. So you did not have any problem to getting adjusted to life in here? No I do not have. Everyone talks about air pollution for example. I get almost used to it – that is scary. I would just say that air pollution is much less in last two years, probably because of windier conditions. But, it was very difficult for first two years – you almost chew air. What do you miss most from life back in your home town? What I missed most is sports I liked to do. I am not very much interested in team sports. I am more into extreme sports. For instance, the Sky Resort is excellent for skiing though it is not enough for such extreme moves. I did not have a mountain bike when I first moved here. I did not have a chance of biking for first couple of years. I am also skydiver and base jumper. There is no real skydiving facility here. But, I did make friends with some of military and search in rescue jumpers. So by the second year, I started to get my sports back and now I have just stared sports club "Wild Nature Sports" here in Mongolia, with aim to introduce and to promote extreme sports in Mongolia. For example, we organized mountain bike race in last summer. I have already done some parachute jumping. Do you already start training in extreme sports? We have not started yet, especially skydiving which people mostly ask about. We are hoping to start training within next couple of years combined with skiing, mountain biking, off road driving and climbing. I started the club with mountain climbing and skiing friends. I have another group of people specialized in mountain biking. There are other friends doing other extreme sports. I am trying to gather all friends doing extreme activities to make all the opportunities available for people. Are there any Mongolian people in the club? Usually, I am the only foreigner in the club. I can speak Mongolian a little bit and try to communicate my Mongolian friends with Monglish while they also speak English a little bit. I am not very good at deep conversation in Mongolian. But I am getting better especially in countryside where I have to use it. I know more words about countryside life and city life, so that my vocabulary is always improving. I can say that I am no longer worried about communicating. As you said, you visit western regions of Mongolia a lot. How about other parts and have you visited there yet? I have been living here for six years but I have never seen Gobi area. Unfortunately, there is no time for me to visit to eastern or southern regions since my job travel is always about heading to western areas. I saw the video in which one guy does base – jumping from a building in Ulaanbaatar city. Do you know the guy? Actually, I am that guy. I did some base jumping in Mongolia. I did post a video of base jumping in 2014, which collected over 20 thousand views within two days. It is getting more popular in Mongolia. One of the groups we are working with is called "Base jumpers without borders". I am hoping club "Base jumpers without borders' is going to bring some other base jumpers and trainers to the country. There are many good skydivers in Mongolia, who are eager to learn how to base jump. One of the main goals working with "Base jumpers without borders" is to do base jumping from the highest buildings in Ulaanbaatar city for charity and raising money to help local schools, orphanage and people who need help. The hardest part is to reach an agreement with building owners over base jumping. Best building for base jumping is "Shangrila" building because it has best landing area. Mongol BASE 2 from Wild Nature Sports on Vimeo. You said that you have already done some base-jumping in the city? Yeah, I have done base-jumping from several tall buildings in the city. Base jumping is very dangerous but it is what I like most. Base-jumping is not a crime. It is sport as same as other extreme sports. I want to show positive view of base jumping in the city, so that more people are going to understand. It is exciting because it is dangerous. It can be done safely. Hopefully, we can do it. Also, I do skydiving regularly at Nisleg center, which is a flying community. Are you living alone or with family here? I came here with my dog. He is the happiest immigrant in Mongolia because there are so many animal parts all over the city such as bones. He works with me in the countryside and loves it out there. I have a girlfriend who also does skydiving, with the certificate of skydiving received after doing three month training in USA. How did you come to Mongolia? One of my old university professors was asked by the company I am working for to be exploration manager in Mongolia. Oil and gas industry had not been highly developed in Mongolia, which means there was lack of experience. They brought him as experienced professional. When he came here, he brought me and one other expat. And, we started exploration operations as team. However, my professor already left with the guy who came with us after their contracts finished. What are your top tips for foreign people coming to Mongolia to live for long period of time? Don't be scared of it but don't expect it as same as your country. It is going to be different and difficult sometimes. To me now, I know where all things are. It does not make me crazy anymore. So, just be open-minded and be cool to new culture. Mongolia is different from other Asian countries. It has own thing and might be a little more wild. If you are coming to UB, you will find everything you need. If you are coming to countryside, just have a fun. How is the cost of living here? You know, it is very strange thing because it is more expensive than where I was living in USA, including my apartment rent and food. That is difference. Developing countries are usually different. What would be your dream expat destination? I really like Europe for different reasons. If it is not Europe, it might be South America. I like Argentina where there are big mountains where I can try my extreme sports. It is all about choosing mountains first and then place. If you can, what would you have changed here? There is certainly nothing I can change. I feel Mongolia is going to change in good way for next 5-10 years. Mongolia is very old country and has old culture. But it is actually very young, when it comes to democracy and new structure of government. So, there will be a lot of change going to happen. I do not think Mongolia has a huge problem. 98classMPA from Wild Nature Sports on Vimeo. November 9 (gogo.mn) GoGo.mn usually delivers Mongolian photographers works as series. This time, we featured photographer D.Uchral, who captures mainly nature. He has started to take nature photos since 2012 and he has travelled around 11 beautiful aimags of Mongolia so far while capturing fascinating photos. If you want to watch more of his works, please visit at his Facebook page.